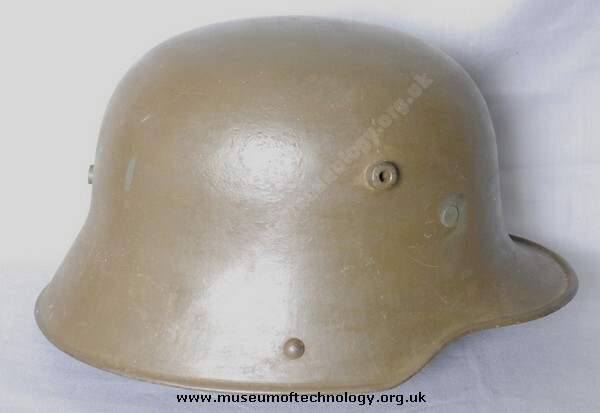 These first German steel helmets were also nicknamed 'coal scuttle' helmets because of their shape, not coal bucket. The 'Stahlhelm' fist entered service in 1916, and whilst the traditional Pickelhaube spiked helmet was relatively obsolete, it did continue in front line service, certainly well into 1917. It is known that troops serving in the same rifle companies wore a mixture of both forms on the Western Front, the steel helmet taking time to reach all branches. Indeed pickelhauben were still issued even after the end of the First World War, but as stated earlier, by then were for ceremonial duties.